See also original RESELLER 20 plan location on their website! Reseller Features That You Will Love! 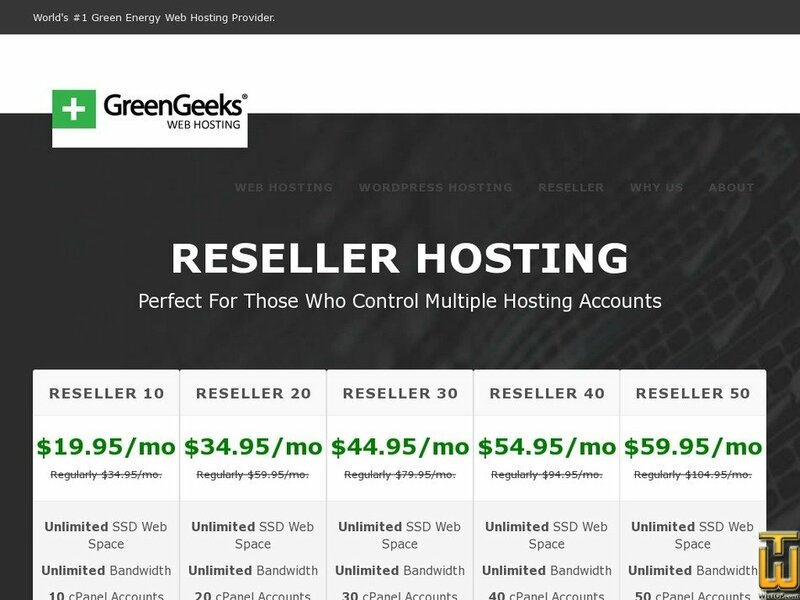 Hosting your accounts somewhere else and looking to switch to GreenGeeks? Our migration specialists will move your website for you, free of charge*. Take advantage of discounted hosting account pricing as you grow your total number of accounts. Wholesale pricing as low as $2.00 per month. Have an account that uses more resources than others? No problem, our scalable platform will allow you to allocate resources to just that account! Register or transfer .com, .net. org, .ca and 1000+ TLD's for your customers with our wholesale domains directly from your account manager. Your accounts will enjoy the latest speed technologies such as Solid State Drive RAID-10 Storage Array's, PHP7, Caching, CDN & more. Customize your DNS with private nameservers and customize the control panel your customers see with your brand's logo and colors. Keep your web hosting business organized by utilizing WHMCS Billing System to manage and invoice your clients. Your accounts will be secured against constant threats with our custom security rules, zero-day vulnerability and real-time 24/7 security monitoring. Hosting specialists standing by 24/7 to ensure that you are completely satisfied. Receive help via live chat, e-mail ticket or telephone.